Doubtless, the torrent caused by Iranians’ wrath will be stronger and more destructive than nature’s flood since the social wrath against usurpers of power is unstoppable. Thus, the mullahs’ scheme to censor news on country’s destructive flood will not avail them of the consequences. The propaganda machine of the religious fascism ruling Iran has focused on censoring the news and the ensuing protests of people cut up in the torrents of this disaster in order to avert the wrath of the Iranian people. Nonetheless, the explosive social upheaval has reached such a treble that has compelled acknowledgement by some officials, especially since the social media activity is undermining the state censorship. “I told the people from state TV who were here that if the authorities had put up a berm of only half a meter high, we would not have had this problem. Only if they had given coverage to our problems,another added. While the regime ruling #Iran refuses & fails to provide any aid to the Iranian people in the face of #IranFloods, these little kids are helping prepare sandbags. People, though, take advantage of any opportunity to voice their protests, including when regime’s leaders visit the flooded areas. They voice their protests right there in front of rolling cameras pointing out the inaction of the regime in providing assistance to the people. State Emergency Organization has announced casualty figures of 66 dead and 478 injured, but state TV has avoided even announcing these fake statistics. 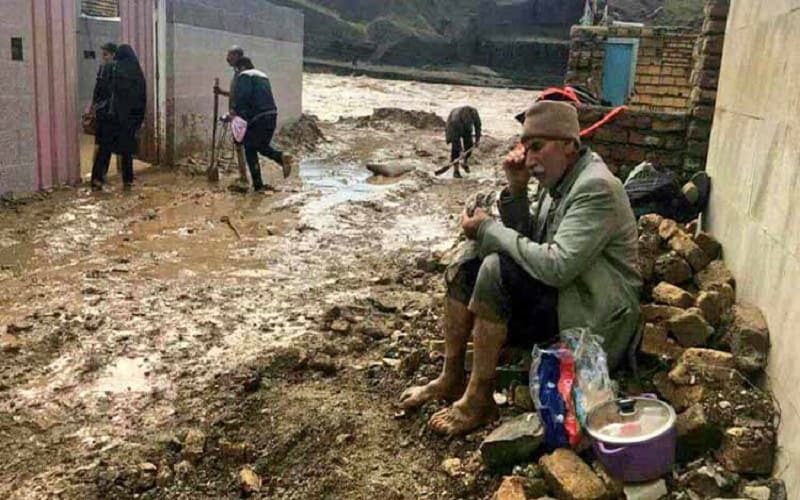 IRGC commander Mohammad Pakpour, in his visit to the flooded town of Poldokhtar, was taken aback by the boiling rage of the residents. He admitted that mismanagement by the authorities and the problems people were facing had created a situation where no authority dared to enter the area. The situation is so tense that some regime officials are making use of social media to save themselves from people’s wrath by putting the blame at regime’s feet. Regime’s fake news are promptly discredited by the social media, especially regarding assistance to flooded areas that are nonexistent except in rhetoric. Objections to regime’s expansionist policies in the social media are censored by the regime. “Look at these houses that are flooded. This is Khorramabad, right now, Monday, April 1 at 9 am. This is where people are living. When we say let go of Syria and think of us, is because of this. Look at the water in people’s houses. It has crippled us,” one posting said. This is just the tip of the iceberg of wrath and discontent of a nation fighting a destructive natural disaster that the mullahs have exasperated by disrupting the environment. Once the natural storm passes and flood recede, another storm of a different nature is coming: That of people’s wrath that will wipe out the ruling mullahs.